In academia, pop enigma John Maus comes up in discussion about where hauntology meets 'utopian theory', an area of scholarly pursuit wherein blog intelligentsia will discuss John Maus' much vetted 'heaven', and not strictly in hypothetical terms. Read enough of the stuff and you detect a quite strange inference that this nirvana actually exists - in your 'perception is reality', post-structuralist type way, but still. It's the same reason why Ghost Box label refer to their roster not as an aesthetic but as an imaginary world, or indeed why some like to believe that the original hypno-gods – Gary War, Ariel Pink, R. Stevie Moore and lecturer John Maus - will take their place in this nirvana in good time. The first track on Maus' last LP was entitled 'Heaven Is Real', and it's to the Minnesotan's credit that on We Must Become The Pitiless Censors Of Ourselves you almost believe him. So a wonderland is born, not for the setting for a story, but as a place to live. Such ideology represents the very purest expression of post-irony in music. With the sad-eyed Maus running out of past, and flat out into some existential dead end, the hope and glory of halcyon pop-making throb faintly in the gloom of We Must Become... All that remains is the Cheshire Cat's grin - an obtusely-present echo of what was once a gleaming pop record. Marshall McLuhan's prophecy that "the more the data banks record of us the less we exist" repeats on you throughout. This notion of self-erosion proposed by the production is conceivably the only way in which a pop star can imbue their music with a curious distance in the internet age. It facilitates a kind of re-mystification; an inverted model for self-valorisation which conjures glamour and inaccessibility from the sensation that the man you think is there, isn't really there at all. More-so than the majority of his brethren, Maus' music is exquisitely tragic. William Gibson's past confession that: "For years I have been mourning and not for my dead, it is for this boy for whatever corner in my heart died when his childhood slid out of my arms." comes to mind. 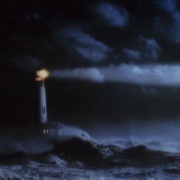 The John Maus presented here is lost in music, the last boy on the moon, a "poem frozen in time on the boundaries of human experience" to paraphrase Gibson. Rather than a yearning for childhood, the bloggers interpret Maus & Co's sadness as a type of subconscious mourning – a sense of loss for the sleek tech future promised to Generation X but never fulfilled. Maus is part of the never generation - the pale mutiny of the dispossessed voidoids' hatched in a misty somewhere between fictive and mundane - as recounted on ‘Quantum Leap’ "A dead zone is a sign of the times, yeah". H-pop is underground dissent by memory - as if the rot runs so deep that our memory is the last haven amidst what Gibson refers to as the "endless digital now". The more unsure the listener is of the exact spatial provenance of Maus' recordings, the further into this liminal hinterland they go: deeper into Neal Cassidy's second America, The Network, Cyberia, The Fourfold or what Ariel Pink refers to simply as True Love. Indeed, some 30 or so years after The Radiophonic Workshop entered the the 4th Dimension, Maus' implacable domain sounds just that – a 4th dimension. Its atemporal feel and overall state of being – a queasy type of dyschromia - communicates eternity and infinity more effectively than all the efforts of Yes, Genesis and ten Spaceman 3's combined. It seems cosmic cyberpunk and hypnogogia make a perfect match. We Must Become… wears a more presentable finish. The reedy synths and foam-rubber bass lines aren't quite as hard on the mix as before, and apart from oddity 'Matter Of Fact' the wandering sound art has been replaced with songwriting - refined, fully-realized and fully functioning verse-and-chorus fare, which nonetheless subtracts nothing from Maus inherent eccentricity or the music's unbalancing palpations. An electric sonata of sorts, 'Hey Moon' leads a spotlit ballet around Maus and guest star Molly Nilsson's stolen kisses. A delicate lyricism resonates the song, captured perfectly with "It's just you and me tonight, everyone else has gone to bed" - the words caressed with as much droll melancholia as Marcel Marceau tracing the parameters of his invisible box. In the pantheon of unsettling cover versions, from Devo's 'Satisfaction' to Einsturzende Neubauten's version of Lee & Nancy's 'Sand' - Maus' take on 'Cop Killer' is a worthy entry, transforming Body Count's riot anthem into a Pat Boone ballad on Alpha Centauri. 'Streetlight' boasts classic starpunk stylings - all Googie-style architecture and benign space colonialism; both groovy and quaint. The perfect-blue arpeggios are painted in watercolours and lined in beige plastics, while Maus' baritone – a blocky, rasterized presence - burbles in oodles of reverb, delay and a flurry of static. The similarly sci-fi snazzy 'Quantum Leap', with its squealing synths and neo-classical patterns, borrows from Daft Punk's 'Superheroes'. It recapitulates the major role the French duo have played in the formation of H-Pop. Maus' is a passage between the Parisian's childlike glee and his sometime collaborators Animal Collective, who employ the same pre-sexual idealism in the making of their own tech-bucolic version of utopia. Someday music historians will work out what excessive voice manipulation has to do with utopianism (with AC, it's a fundamental) but until then just enjoy the space and perception-altering trip it affords. While 'Head for the Country' sees Maus in full Tiger city mode, the vaguely eschatological 'And The Rain' ("came down") revives the conviction that H-pop is a post-event music, the end game. Where do we go from here? It's a question that pops into your head intermittently while listening Maus and H-pop bellwether Pink. Elsewhere 'The Crucible' continues with the baroque influence scattered about on 'Love Is Real', building on Maus' dalliance with messianic imagery and Christian mythology. Equally, there is the fittingly titled 'Believer' with its chintzy, ersatz church organ - set to take hold as H-pop instrument de rigueur in the coming year (see Wu Lyf & I Break Horses).The final and best track, it takes a certain kind of artistic integrity to drown such a beautiful pop song in layers of crap. Many a chart-topping electro act who would kill for such a sumptuous hook. The oppressive bass anchoring these ten simple songs is a hallmark of the majority of American Glo-fi, and is said to be the bridge between us and the h-popsters fictional universe. The Minnesotan firmly believes he can lead his flock from the black void which We Must Become… nestles in. Over the rubicon he goes and into the 'consensual hallucination' - an omniverse where the sun setting behind OCP's Megacorporation becomes the moon rising on Fantasia's Sphinxes Gate; a parallel field of existence that maybe looks a little like the over-filtered haze illuminating Simpson & Bruckheimer's California (or as Drowned In Sound suggested - a Gregory Crewdson still). In fact The Neverending Story (soundtracked by Moroder, FYI) is a good reference point here, since it concerns an inexplicable, advancing vacuum known as "The Nothing", and finishes with an unusually dreamy boy empowered to reconstruct the world in his own image, from memory. Above all else, Maus' music worships at the quixotic principle that if you dream it, then so it will be. And that, when you get down to it, is arguably the core impetus of pop music: a ludicrous suspension of disbelief, powered by an unquestioning allegiance to otherworldly pop-stars previously reserved for gods before the invention of mass communication. Surrender to it, and it is heaven – the ecstasy of John Maus, a poet of the surface of things.